my name is athenkosi kitsli i'm from goodshepherd primary school and i want to thank the Rhodes University and sonic arts. The 2014 peace day concert was a success to me and my school and also we won 2 certificates and I also want to say congratulations to asemahle singata for winning the best male rapper. WELL DONE Khutliso daniels for winning the all 5 certificates you guys derserve it. 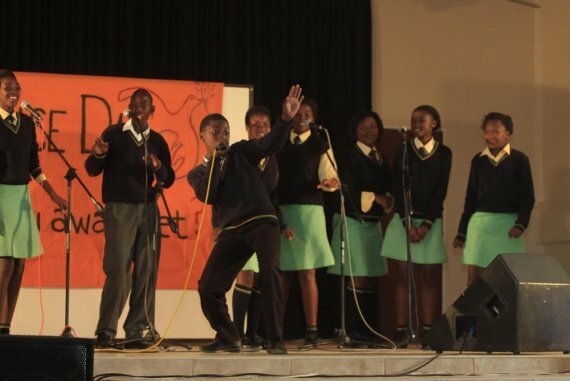 After many weeks of hard work dedication and hours spent on preparing for the Third Peace day Concert the time finally arrived for the 5 school from in and around grahamstown to preform their own Peace days songs at the awarenet Peace day Concert. Very excited all the learners arrived at the concert venue smartly dressed in their schools uniforms chatting away about how they are going to move and sing on stage. Small groups of people started gathering in the hall sitting down looking around waiting anxiously for the concert to start. A very excited atmosphere filled the hall as the Mc went on stage to the start the concert. People were clapping as he entered the on stage in a very professional way he introduced himself to the audience he Introduce the judges and the schools partaking in the concert. A little entertainment was given from a student group calling them selves Elastic,a very upper class rapping group that preformed.They got the audience singing and clapping along while the performance was on the going on.After a superb performance from Elastic it was now time for The different School groups to preform.Lots of the audience was filled with the family and friends of the learners preforming and they seemed very eager to see the hidden talents these kids consisted off.When the first group came on stage I was filled with pride and emotion knowing the hard work and dedication that went in preparing each and every one of the youngsters for this concert.They went on stage each and every learner from the different schools and sang and danced their hearts out.I knew that deep down inside of themselves they all wanted to win the competition with sincerity.After every performance the crowd would go wild screaming and clapping for their favourite group. I think the judges has a very hard decision as to who should be the winners they thought every group was brilliant and took quite a while to decide on the overall winners of each category.After a long buzz they finally came to their decision.I must admit the proudest of principles came to support he learners Mr Radio from Khulitso he really took pride in each and everyone of them.Some of the teachers from Ntaba and C.M Vellem also came and gave their support towards their learners Preforming.Lots excitement all around as the winners where announcement.Kids went mad running on stage when they heard there schools names called out,happily they went on to collect there certificate.The Media Grocotts Mail was also there clicking away taking photos after the concert they were ask what they thought of the concert? They were very impressed by the way the kids preformed they way the sang and also Wow by the fact that all songs were written by the kids. The peace day concert was on the 5th of october at the Noluthando Hall in Joza location near the Duna library.It was awesome and there were five schools participating:Ntaba Maria,Victoria girls,Good sherperd,khutliso daniels and obviously CM Vellem.There Hall was full of hundreds of people around Grahamstown and outside.What i learn't is that no one is a looser. The first school to perform was Good sherperd and they did well i think.We were the last to perform our peace day song but the beat was the same from the Sonic Art Studio and Rhodes university as well take part and we won the best performance just like last year. .
my peace day experience i was so happy to see people pappy.when the mothers your people in give were the my like. Sayivuyila the peace day some of the shools we the thina she say much become for by you.Many so things best say were you may there she was.come you are opporites. So its very nice concert because its not fights very very nice concert. The day we perfom we were happy and excited and sing very well but we only won the good performance but still we were happy to won the good performance. The most school that won the most awards it's Kutliso Daniel secondary school and Good Sherped and Ntaba Maria at the moment i was very happy. Awerenet has helped us and we love awerenet alot. it was a great day to me and my friends i wasnt thought it will be a good time to me.i will never forget that day my life.it was my first day to won into a thing to school.and i like what we doing because it make us happy.i feel happy because i like what im doing and we enjoyed that all of us no body was angry everyone was happy that day i hope my family pround of me and my school.and i love u all guyz i like to work with you guyz.i like awarnet it keeps me busy at school i lv u awarenet thank you for all you done for me i love you all guyz. The peace day concert was very enjoyable,we sang,danced and we had lots of fun.When it was our turn to perfom we were a bit nervous but when we got on the stage you could see the eyes staring at you.I was shaking ,actually I was not the one shaking almost all of us shaked.My most favourit part was when we came all eyes were staring at us and we felt like...popular.One of us has a thing called"stage fright".We also won two certificates the runner up male rapper and the runner up best performance.Even if we did'nt win but we had lots of fun,the school's that were there were CM Velem,Kutliso Daniels,VGHS,Ntaba Maria and the Good Shepherd.We did'nt care whether we won or lost but what was important was that we had lots of fun and I know that we did;nt just go there to have fun but also to get thumbs up. We had some of the school's saying BOOO but we did'nt because we knew that if we also shout out BOO people could have hated us.I knew that when we came and we went out of the taxi I thought to myself that they are thinking that we want to make our selves on top just because we go to a school that is far away from the location but NO they thought wrong we also wanted to have fun like all the other school's that were there but most of all I had...fun so ...thank you for watching us and we are also glad that we helped you. Hello guys today am gonna tell you about the Peace Day concert.This concert was held at Noluthando Hall on the 26September 2014. We were so nervous amd also scared at the same time but actually we were very emotionally. On that day there were six different kinds of schools. We were the the only Primary kids.It was a wonderful day to us.We were so proud of ourselves very much. And the competition started we were shavering.So the introduction was made by two young guyz they were rapping they were so great. After they finished the jugdes mixed all the school's name in a bowl we were so scared because we didn't wanna go first but luckily we were the first ones. So we started standing up from our chairs. People luckily showed respect by clapping their hands.While we were on stage i didnt realise that there were many people I started shaking. And the music started Akhona made the introduction of thanking awarnet for everything they have done for us.Chulumanco then thanked the sonic arts studio and also Rhodes University. Then one of my classmate Thandolwethu started with the rap of the introduction and we went by our ambicious voice we went with our chorus.Then other of my boys classmates and one girl they raped and it was so great even though we made a mistake but atleast we enjoyed ourselves. Then other schools went and sang their songs they song beautifully. Then it was time for the judgement we were so nervous actually mixed emotion held us up. Then the judges were done then they started judgement. About the Peace Day song i loved it alot,i did enjoy it but the best part was that we won and we sweaped all of the reward's and the best female repper was my best best friend,she was that happy and she seemed like crying but after all we really did enjoyed the CONCERT.And the biggest wish is that i hope even next year we will do the same.Even our princpal was there to support us,Oh i won't forget that i was a repper too,I was happy that day. 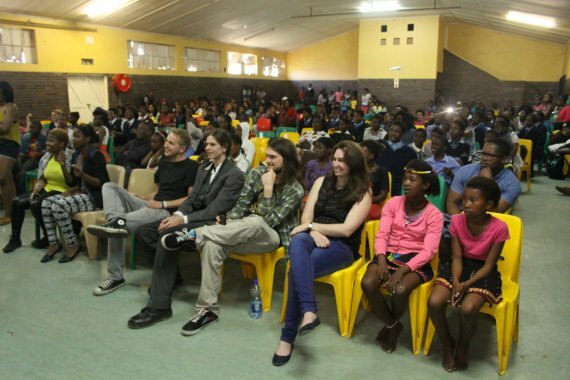 The 26 of September 2014.What a wonderful day indeed.Six schools competing for a music competition but still spreading the word of awareness around the world,it was not just a competition it was somehow like a way to get to know each other and enjoy ourselves time and trying to spread the word of Peace,Love and Joy. It was a phenominal experience and scary too because the were so many people there.What was so nice and awesome was that when we arrived they played some music,I mean popular music that was meant for hip and happening people like us.The concert started and we began to take our seats and they announced that we were the first school to sing our hearts were beating like drums we were terrified but confident too. peace day day competition we were singing about peace. we won 4 certificate and our best female rapper won head phones. we enjoyed it it was nice there were lot of people there they came to suport us and other schools. and some of them came to talk about heritage day and they were singing heritage music. The peace day concert was really awesome and I had a lot fun thier and the was a lot people thier but I hope they loved me thier because my school say's am the best and I rap like a beast.Before I went thier I said to myself we will win but things changed when the competition stared to get more tougher.When I was about to rap I was confidant but other friend was not ready to rap so as the chorus was singing I said to him we are men and men do not give up as my men john cena says.So go up thier and drop it like its hot and he did and he won best ranner up for best male rapper. My whole peace day experience was very interesting and fascinating at the same time.We sang peace songs.We really enjoyed our selves. I wasn't there so I am not going to lie,but I bet it was awesome challenging other schools.I was really excited that we were going to enter a competition. The singers and rappers which were my classmates were happy,ya thats pretty much it. On the 26th of September 2014 we competed with other schools at noluthando hall. It was great because us rappers we had to write our own lyrics and the ladies had to be creative and create a chorus. We did practice for months until we got the crack out of it. Later that day we did arrive at noluthando hall and we saw lots of people ready prepared, i was nervous but i had to be strong because the judges were gonna expect us to rap. We were the first one to perform on the stage, to be honest i had a great time even though i didn't win but i had a great time. On that day I was nervous but I told myself that I can do it. When we arive at Nolthando Hall then I saw many schools there were 4 plus us there were 5 . The happy moment was when we got 2 awards I felt very happy,but the worse moment was when 1 of our girl lost her bag with her school books. But the moments there were very cooooooooooooool!!!!!!!!!!!!!!!!!!!!! I had a great time at the peace day concert.I experianced lots of great rapping but i think my school was the best although we didn't win the best rap song but we did win the runner up for the best rap song. All the schools new what they were doing.I think we were the only school that was nervous maybe thats why we didn't win the best rap song award.I wanted to win the best male rapper award but clearly I wasn't good enough.I think I was the reason my school didn't win the best song award but I tried my best.although we didn't win alot of awards I really had a great time. Nathaniel Nayluza in action during the peace day concert. During the last four years we have hosted three awarenet Peace Day Concerts with five different schools participating every year. All songs were originally written and rapped in isiXhosa or English, with lots of time and effort going into composing, rhyming and practicing for the big concert. Participating schools were Mary Waters HS, Nombulelo SS, C.M Vellem HPS, Good Shepard PS, Ntaba Maria PS, Khulitso Daniel SS, Nathaniel Nayluza SS. Intense training in lyrics and vocal training was given by Sonic Art Studio. After about 10 weeks of preparation it all came together at our annual Peace Day Concert (International Peace Day: 21/9) which is usually held in the Joza location. Teams competed in rapping, singing and performing against each other for the best overall Peace Song. Overall winners so far were Mary Waters HS, Ntaba Maria PS and Victoria Girls High School respectively. The best male and female rappers also receive a certificate and a prize for their effort. Another certificate is usually given out for best lyrics. The concerts were well attended by local people. Subsequently, all songs were recorded professionally once by Sonic Art Studio and twice by the Rhodes University Music and Musicology Department. Two CD launch parties took place so far, the third will happen soon. 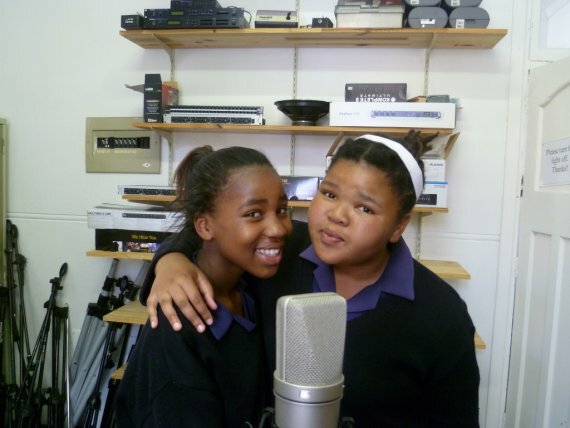 The overall winners (Mary Waters HS and Ntaba Maria PS) of the best Peace Song also had the opportunity to have their own music video professionally made. Victoria Girls High School’s music video will be produced soon. Mary Waters HS’s video was taken in the areas around their school, while Ntaba Maria PS’s was taken in the Botanical Gardens and at the Settlers Monument with a beautiful view of the city. This year we will be hosting the Peace Day Concert again in September 21 and training for this big day will begin in the third term.